I’m about to discuss an investing strategy that will blow your socks off. Not only would this have been the best investing strategy in terms of returns, but it would also have been almost completely transaction cost and stress fee. It involves only two assets and only three transactions OVER 40 YEARS. We assume only two asset classes: gold and the S&P 500 (calculated in its total return version with dividends re-invested). 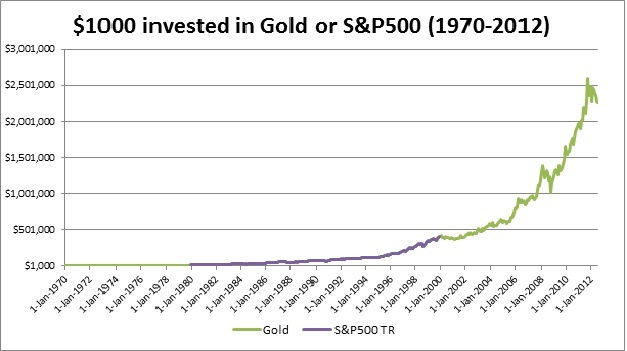 Through 1970-1980 we put 100% in gold, through 1980-2000 we put 100% in the S&P 500 and then back to 100% in gold from 2000-2012. An initial investment amount of $1,000 would have grown to over $15,000 by the end of 1979- that’s more than a 15X return. Then from 1980-2000 the $15,000 would have grown to over $400,000, just by leaving the money in the S&P500 and re-investing dividends. From 2000 onwards and moving back to gold, the investment amount would have gone from $400,000 to over $2.5M in the middle of last year and languishing at around $2.2m today. You initial capital would have increased by a staggering 2,265X over the period in question. Now this is by no means an over-optimised or cherry-picked strategy. We could have put money into the Japanese TOPIX in the 1980-1990 period and then switched to Nasdaq from 1990-2000 rather than the S&P500. We could also have substituted the more volatile and lucrative silver over gold in the 70’s and the 00’s. Returns would have been astronomical. You have to ask yourself why this type of simple, long-term strategy is never recommended to clients? Well, the first point to note is that investors wouldn’t pay very much in the way of fees for this type of investment advice. It comes across as too simple and that means low fees. It’s much more profitable to sell investors complex investments that they don’t understand and charge them high fees. Only trading the portfolio once every 10 years is another issue. Investment professionals make money from turnover: they take a cut of your portfolio every time you trade. We see that a lot of investment material is short-termist in nature and really an inducement to trade. This plays into the mentality of the investor who feels the need to be “doing something” and is naturally very profitable for the broker, but is not the best investing strategy for the client. The key to this investing strategy is being able to cut out the noise and be invested in the RIGHT ASSET CLASS AT THE RIGHT TIME. To do that you need to understand the economic climate. Unfortunately, all too often we are swayed away from long-term economic issues by short-term news that ultimately has NO IMPACT on long-term returns. The 70’s and the 00’s were decades of declining economic performance, where central governments increased their regulatory activity and interventions in the economy. In that sort of climate, you needed to be invested in real assets like gold and commodities. In periods of economic growth and increasing productivity, you would be better off in investments with scope for capital appreciation, such as the stock market. The best investing strategy is to focus on the macroeconomic environment and get your asset allocation in order first of all. For those with additional time, you can optimise your strategy within the asset class itself. Simply work out what sort of economic environment we are currently in and sink your long-term capital into the appropriate asset classes. At the present time, I believe we continue in a period of declining economic performance and hence gold and commodities remain a better investment than the stock market. So why look to complicate things?